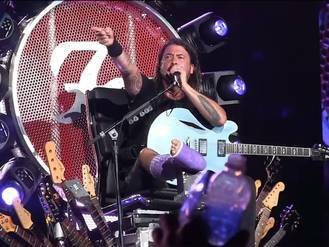 Dave Grohl is making a strong recovery after breaking his leg falling off stage. So strong that he invited his doctor on stage in Boston to help him perform "Seven Nation Army" by The White Stripes. The Foo Fighters frontman was forced to pull out of Glastonbury last month after taking a serious tumble in Sweden, but has since resumed touring, performing in a Game of Thrones-style throne so as not to disappoint fans. Grohl invited orthopaedic surgeon Dr Lew Schon to join the band and sing vocals for the 2003 hit and fair dos, he did a pretty good job. "Holy s**t that's actually my doctor. What a badass!" Grohl yelled once Schon left the stage, as the crowd cheered. Foo Fighters have rescheduled their cancelled UK shows and will now play Milton Keynes Bowl on 5 and 6 September and Edinburgh's Murrayfield Stadium on 8 September. Grohl thanked fans at the time for their support. "You have always stood by our band and we will always stand by you," he said. "Like I say at every show, we wouldn't be here if it weren't for you guys and I mean that. I thank you from the bottom of my heart and I will do everything I can to come back and give you a night to remember for the rest of your lives as soon as possible."